Our high temp masking tapes can withstand temperatures of up to 260˚C (500˚F) and come in a wide range of sizes to suit most applications. The quality of a coating job is largely dependent on the preparation, including neat masking. This is where our special high-temp masking tape comes into its own - we use it and recommend it! 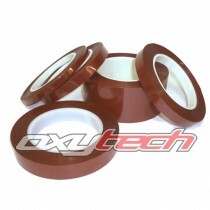 Available in a variety of sizes and by the roll or as a multi-roll pack, high-temp tape will save you much ..